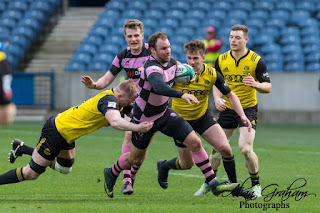 It was another battle that went right down to the wire between Ayr and Melrose on Saturday at BT Murrayfield, but this time it was the Borderers who got their hands on the silverware, their 23-18 win securing them the BT Cup seven days after Ayr had beaten them to claim the BT Premiership title. Ayr couldn't have got off to a better start at the national stadium. 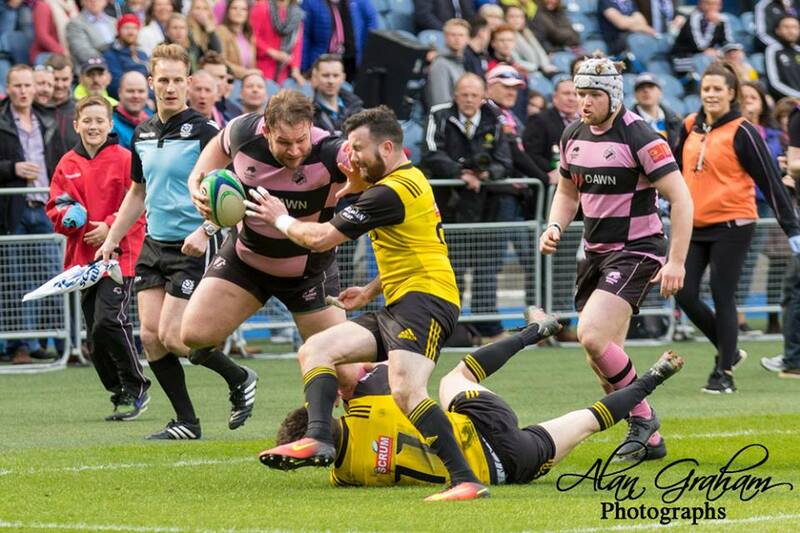 They claimed the ball from the kick-off and made for Melrose's try-line, captain Pete McCallum powering through the defence before winger Danny McCluskey scored in the corner. It was a touchline conversion for stand-off Frazier Climo and he couldn't make it. 0-5. There was no easing into this final for either side. 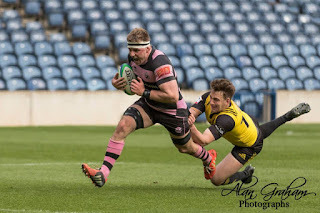 Ayr scrum-half David Armstrong was his usual industrious self, whilst full-back Grant Anderson was ready to barge off on his trademark muscular runs at any moment. Last week's hero Scott Sutherland carried on his fine form, looking majestic at the line-out and snuffing out any Melrose attack that came his way. McCluskey and fellow winger Craig Gossman looked dangerous with ball in hand but those yellow shirts were all over them very quickly. Melrose also had to contain Ayr's mobile front row of George Hunter, Steven Longwell and Lewis Anderson. The two sides were evenly matched at the set-pieces, Ayr putting Melrose under pressure at their scrum before being penalised at their own put-in. The Greenyards men couldn't capitalise though, Grant Anderson appearing with ball in hand after their penalty line-out and shooting off. Centres Ross Curle and Stafford McDowall had their eyes open for any gaps, and Curle spotted his first of many, breaking away with McCluskey in support. Melrose, of course, turned defence into attack with a bit of mid-air poaching but ended up in touch. It was the last outing for the back row of McCallum, Blair Macpherson and Will Bordill as the latter moves on due to work commitments, and they had another good day. Macpherson was launched at the line-out, securing good ball for Armstrong to flick to McCluskey, but the winger couldn't get away before the first of a couple of small scuffles broke out. It was swiftly dealt with by referee Lloyd Linton. Melrose evened things up when their skilled and speedy prop Jamie Bhatti bundled over for a try. Stand-off Jason Baggott missed the conversion. 5-5. There was another prop on the move moments later when Longwell blasted his way up the touchline on a joyous gallop but he was isolated and Ayr were penalised for holding on. The penalty count was creeping ever higher for both teams, and line-outs were exchanged before Curle used those dancing feet to let Sutherland, Climo and McDowall make their way through the Melrose defence. The Borderers regained possession though, and Lewis Anderson, Bordill, Macpherson and second row Craig Stevenson had to put in some hefty tackles to keep them in check. They soon took the lead though, thanks to a Baggott penalty. 8-5. Climo swiftly replied with a penalty of his own. 8-8. 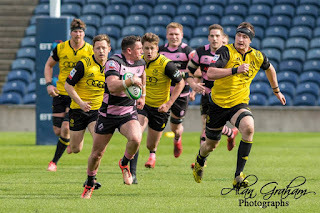 Both sets of players were run ragged as the half drew to a close, Climo and Hunter busy in attack for Ayr, and centres Nyle Godsmark and Craig Jackson for Melrose. Armstrong set off on a run for Ayr, with Climo, Lewis Anderson and Curle in support, the latter turning up on the wing. Moments later he was back in the centre, homing in on a Melrose pass and racing away with McCluskey backing him up. Half-time was a welcome rest for everybody, fans and players alike, but it was straight back into action at the resumption as Baggott kicked Melrose into the lead. 11-8. But Ayr were pressing for their line, Curle and Stevenson getting over only to be held up. McCallum, Armstrong, Gossman and Climo moved things on but Melrose ended up with a free kick. From the line-out, Armstrong whizzed through a gap, too fast for the defenders to get him. Bordill was with him though and took the pass to canter away for a fine try. Climo converted. 11-15. It was an exciting period, with Curle intercepting again. Gossman took the ball on and chipped, but it was Melrose full-back Fraser Thomson who claimed it. Sutherland nabbed Melrose's line-out, and Climo made a half-break but the defence was tough. Another petty fight was again subdued by Linton before Climo stretched Ayr's lead with a penalty. 11-18. Climo, McCallum and McDowall were in attack mode for Ayr but Melrose regained possession and shot off, with Climo slumped on the ground after a knock to the head, being speedily attended to by the Ayr medical team of Graham Hollins and Helen Reid. The referee let the game carry on and Melrose's George Taylor ran away for the try, which Jackson converted. 18-18. Of course, it was going to come down to a nail-biting final ten minutes, as games between Ayr and Melrose invariably do. It looked like it was going to go to extra time as it had done in the cup final four years ago, but Melrose turned over with ninety seconds to go and Godsmark scored the try, which was unconverted. 23-18. Ayr all but emptied their subs bench but it was no use. A line-out gave them a glimmer of light but the clock had gone dead and soon the ball went dead to send Melrose and their fans into delirious celebrations. It was disappointment for the double-seeking men from Millbrae but the players have given their supporters another wonderful season to look back on, with a league title to savour and many highlights to toast at next week's end of season awards dinner. Final score: Melrose 23 Ayr 18. Photos courtesy of Alan Graham. Please seek Alan's permission before reproducing for commercial purposes.